In this workshop Derek will teach the importance of awareness of all aspects of yoga: the body, mind and soul, and is the culmination of a life time`s study, practice and teaching of yoga. The physical exercises include both gentle stretching and also strong challenging exercises. At all stages students work within their own levels of ability. Emphasis is placed on practising yoga with awareness, thus helping to avoid unnecesary injury, but also to begin the process of harnessing the power of the mind to transform us. in over forty years of teaching Derek has worked with many internationally known teachers in this field. His teaching has included all aspects and levels of yoga and various styles, including Iyengar, Astanga Vinyasa, Sivananda, Vivekananda, Kundalini etc. He has taught Summer Schools in France, and some classes in Tamil Nadu (India) as well as many parts of England and Wales. To teach engaging classes that are developed with contemporary life in mind, offering a haven of vitality, rejuvenation and tranquillity for busy people in Shropshire. This term will be moderately energetic and will focus on developing upper body and core strength along with whole body flexibility. Two beautiful vinyasas (sequences) will create ‘yogic fire’ in the body to burn away impurities and help warm us up as the winter approaches. Meditations, visualisations and relaxations will leave you thoroughly refreshed, renewed and relaxed. The class is held in the Library of Meole Brace School in Shrewsbury. To get to the Library, please go to the main reception of the school (photo on the school website home page), and enter the lobby. Go through the doors in front of you and walk across the hall on the left. At the back of the hall on the left there is a glass door which leads to a courtyard garden, go through this door and through the garden. You will see the library to the right. Go through the door straight in front of you and turn right, the library is on the right. toilets and changing rooms on the left. 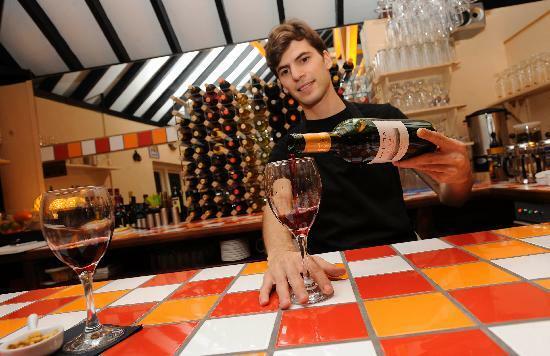 Casa Naranjo is a relatively new family run tapas bar right in the centre of Shrewsbury. Following success with their first Tapas Bar in Bridgnorth, Alfonso and Emma Yufera-Ruiz opened this authentic slice of Spain in Shrewsbury several months ago. Next door to The Good Life, Casa Naranjo is and excellent evening destination either for informal socialising over food or for a date night with your current squeeze. This is authentic tapas, and so the menu is a list of small dishes that range from a single ingredient simply cooked through to a mini meal on a small plate. The staff recommend starting with two or three dishes because you can always order more if you want to. A variety of vegetarian and vegan dishes are available (no meat or fish) and the staff are very knowledgeable and accommodating about ingredients and which dishes suit coeliac or people with different allergies. The waiting staff buzz around like bees and are very efficient. All dishes are pepared to order, and they come out as soon as they are ready. This means you might end up being served all three of ‘your’ dishes and your companions none of theirs – lucky you! It is probably best to agree your sharing or not sharing strategy at the beginning of the meal….. There is an appetisers and cold Tapas menu that includes bread, olives, cheese and salads; a hot fish and meat Tapas menu with traditional offerings such as Iberian pork, lamb casserole and Albondigas (meatballs); and hot vegetable Tapas menu that includes patatas bravas, tortilla and garlic mushrooms. There is a fiesta menu and a 2 for £5 deal served weekdays at lunchtimes and monday evenings. The range of dishes available means that whichever menu you choose there is going to be something to suit most tastes and diets. The building itself is wood panelled, with cosy pine tables and spanish paraphenailia on the walls. There are two floors, with toilets on the ground floor, and the restaurant on the first floor. Unfortunately I don’t think that there is a way for a wheelchair to access the restaurant, (this can sometimes be the case in Shrewsbury with our listed buildings and flood prevention measures). In the winter, the convivial atmosphere and Spanish flavours were a much needed mood booster and in the summer, you can enjoy Sangria and pretend you are somewhere far away! I try to choose different things when I visit, but I really can’t resist the Esparragos a la plancha (grilled asparagus with maldon salt), Patatas mixtas (fried potatoes with alioli and spicy tomato sauce) and the Pimientos Rellenos de Queso de Cabra (Piquillo peppers stuffed with goats cheese). I have visited the restaurant four times and only managed a pudding once, and it was a delicious almond tart. With spanish beer or wine and a glass of Sherry or Port, you can expect to pay between £25 – £30 per person. WITH TOM STACEY 18TH JUNE 2011. Yoga Asana, Pranayama, Mantra Meditation and Guided Relaxation. Chi Kung- Chinese Yoga (Qi Gong) literally meaning ‘energy skill’. Date: Saturday 18th June 2011. You can come on the day or book in advance. Go to www.yoga-love.co.uk for info of monthly yoga/Chi Kung workshops. Or come into Sarasvati at The Parade Shopping Centre. 4. And some other things! Watch this space for more info and register interest by signing up for this blog (see sign up button to the top right) or getting in touch. BWY Teachers: Alison Clowes, Lis Wharton, Catharine Hinton (me!) and Faith Page. Membership (£25) also includes a quarterly magazine, discounts on yoga events, courses, equipment and workshops.